Sieht so aus als könnte man sich doch den Traum erfüllen mit dem MC12 Corsa auf der Straße fahren. During last year’s FIA GT championship Maserati drove their competitors into the ground with the MC12 GT1 (which already spawned the MC12). On the occasion of the overall victory, Maserati introduced the limited edition (12 units) MC12 Corsa. The Über-Maserati weighs nearly 400 kg (880 lbs) less than the base MC12 (1,150 instead of 1,531 kg [2530 lbs instead of 3368 lbs]). This corresponds to a power-to-weight ratio of 1.5 kg / hp (3.36 lb / hp). With 755 hp and 740 Nm (546 ft-lb) of torque, the Corsa will run circles around the regular MC12 (632 hp). Engine-wise, edo competition leaves the 755 hp–strong MC12 Corsa untouched. However, the 6.0-liter V12 now announces its power through a newly developed edo competition high-flow exhaust system – and it does so with a soundtrack guaranteed to induce goose bumps! The sports exhaust system with electronically controlled butterfly valves provides visual cues to the MC12 Corsa’s power thanks to dual exhaust tips, each with a diameter of 100 mm (4 in). edo competition put a strong emphasis on quality during its construction. 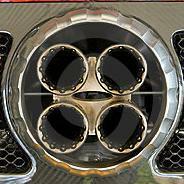 The muffler and exhaust tips are made from durable V2A stainless steel. And, not to be overlooked: a remote control to adjust the sound intensity has been installed! edo competition had newly developed forged wheels (in black) custom made for the edo MC12 Corsa. On the front axle they’re of size 10 J x 19 and on the rear axle of size 13 J x 20. The wheels employed by edo competition are shod with 265/35 ZR19 (front) and 335/30 ZR20 (rear) tires. Dieses seltsame Ding ist nun wirklich schon ein alter Hut.